It probably goes without saying that I have gotten just a little addicted to the Iron Orchid Designs furniture transfers. I can’t seem to stop putting them on things. Today’s victim is a gorgeous dresser that I picked up a few weeks ago. This dresser also came with a matching bed (you’ll see what I did with that later this week), and this was definitely a case where the seller was not a craigslist pro and thus didn’t understand some of the tips for improving the chances of selling your item. Why? Because first of all, she had one ad for both the dresser and the bed, and her lead photo was a dark and blurry photo of the bed. So right off the bat she wasn’t going to entice anyone to click on the ad to see more. Second, the photo of the dresser was also dark and blurry. You really couldn’t see any of the gorgeous details it has. Furthermore, she had very little text with her ad. I think it said something like ‘bedroom set for sale’, which meant anyone searching for ‘dresser’ or ‘antique’ or ‘vintage’ wasn’t going to see this ad. All of this worked in my favor because no one snatched this set up before I could get there. 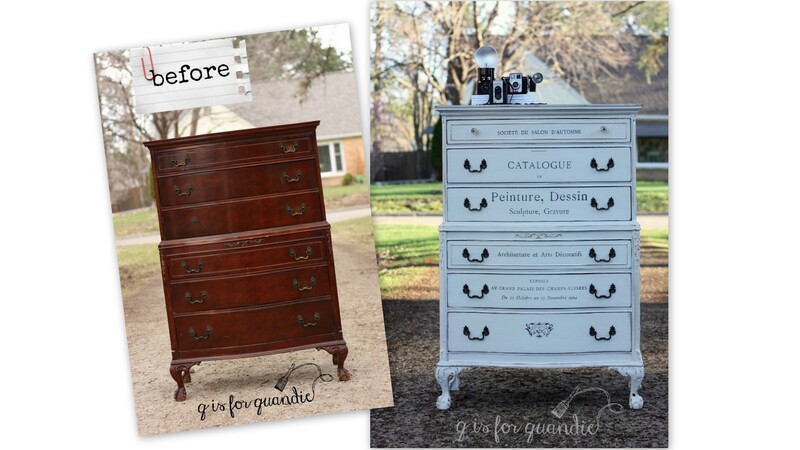 I wanted to use another furniture transfer on this dresser and I wanted a white background for that. Painting one of these mahogany pieces white is always a challenge, plus this one required a little extra repair work as well. In order to spare you from too many boring details, here’s what that included: Ken repaired one of the back feet using a peg and some glue, I filled the drawer pull holes on the top drawer to make up for just one missing handle, I sealed the whole thing with Rachel Ashwell Clear Primer to prevent bleed through, I painted a base coat of Fusion’s Putty so I would have something to show underneath any chipping that wasn’t just red mahogany, I added three coats (yes, it still took 3 to get good coverage, even over the Putty) of Miss Mustard Seed milk paint in Linen, I applied the transfer, I sealed the whole piece with General Finishes Flat Out Flat. But I think it was worth it, don’t you? If you’re wondering about the transfer, I cut it apart and did each drawer separately which allowed me to center the design from top to bottom on each one. In hindsight, if I had to start over on this one, I think I would have switched over to all glass knobs. But maybe that’s just me. 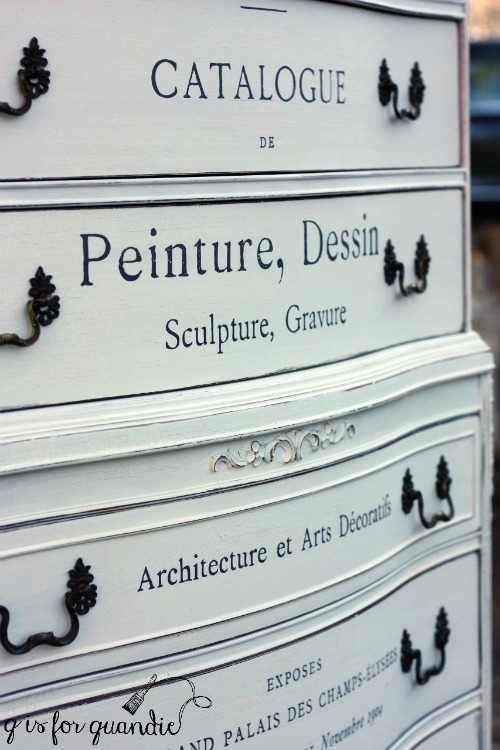 I think the drawer pulls take your attention away from the transfer a bit too much. But by the time I put them back on it was too late to change my mind on that without having to re-paint the whole thing. I also debated painting the handles white to help them fade away. But in the end I decided that I should leave them alone. 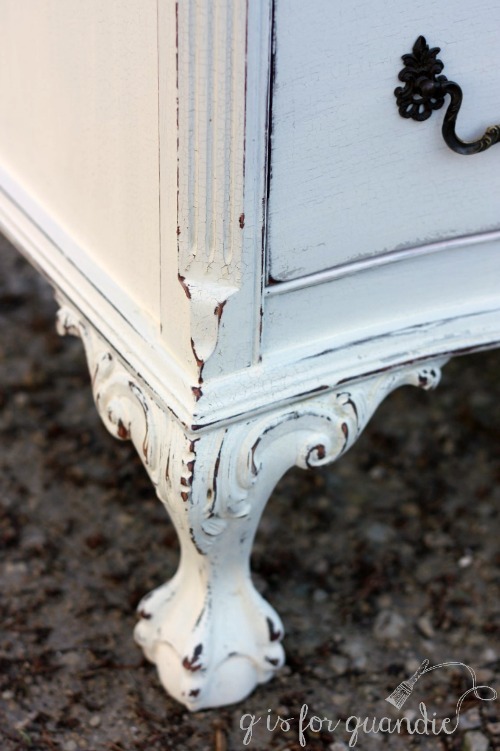 It adds a subtle depth to the dresser where the milk paint chipped without being too obvious of a contrast. 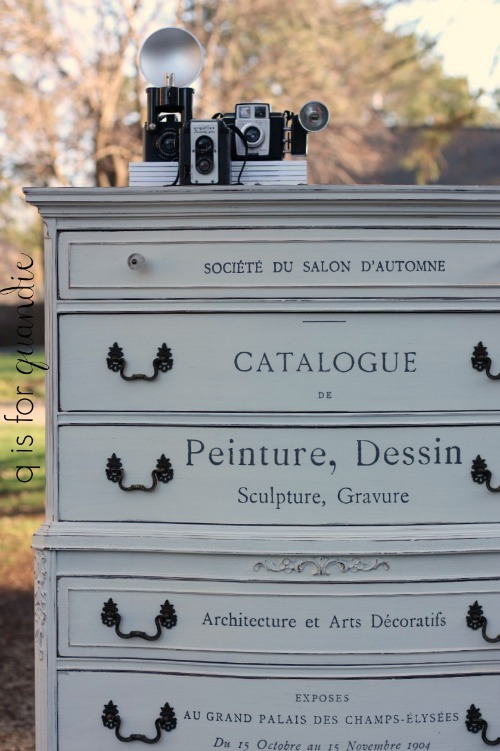 There are so many beautiful details on this dresser including the gorgeous ball and claw feet. I love a good ball & claw, don’t you? It’s possible that I added it too soon, maybe I should have let the milk paint cure for a couple of days first. I’ll continue to experiment with the Flat Out Flat and keep you posted. 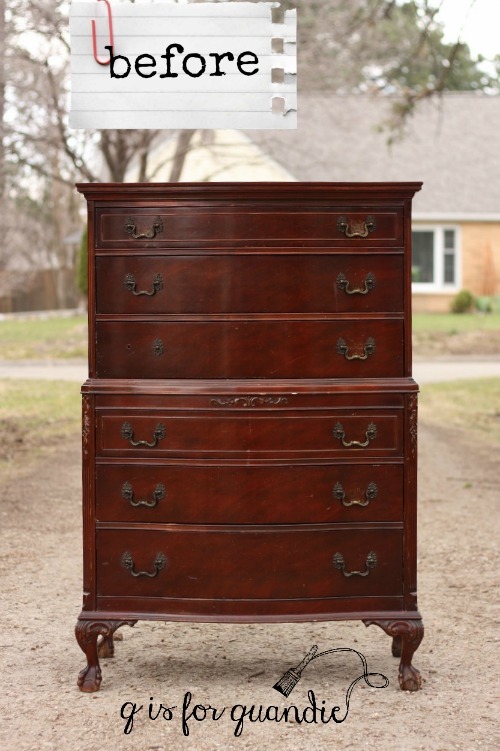 But in the meantime, this lovely dresser is going to be for sale. Be sure to check out my ‘available for local sale’ if you are interested. Previous when is rusty just a little too rusty? Next putting this bed to rest. Q, what are the measurements of this charmer? 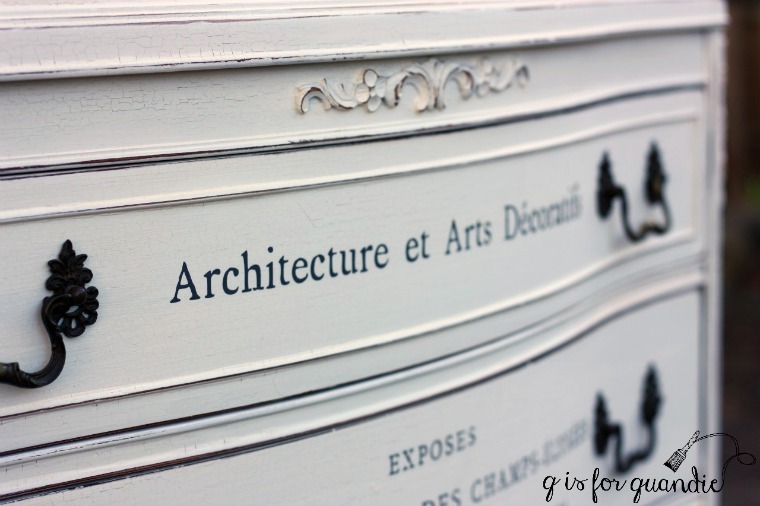 They are: 53″ tall x 36″ wide x 21″ deep. It’s a large piece. Yeah, it’s kind of a monster. Possibly bigger than it looks in the photos. I didn’t put anything next to it this time to help people judge the size. That is a stunner ! And personally, I love the handles. This one wont last long I predict. Love the putty undercoat! Thanks Sheri! I’m glad you like the handles! IMHO if you had used glass knobs it would have put too much accent on the transfers. Plus, I think the lines of the hardware enhance the serif of the transfer text. The current array is very cosmetic, i.e. it blends the whole beautifully. Thanks Lisa! It’s nice to hear that keeping the handles wasn’t as big a mistake as I thought. I love the hardware! I’m glad you kept it. I have to agree with Mr. Q’s assessment. Beautiful piece! 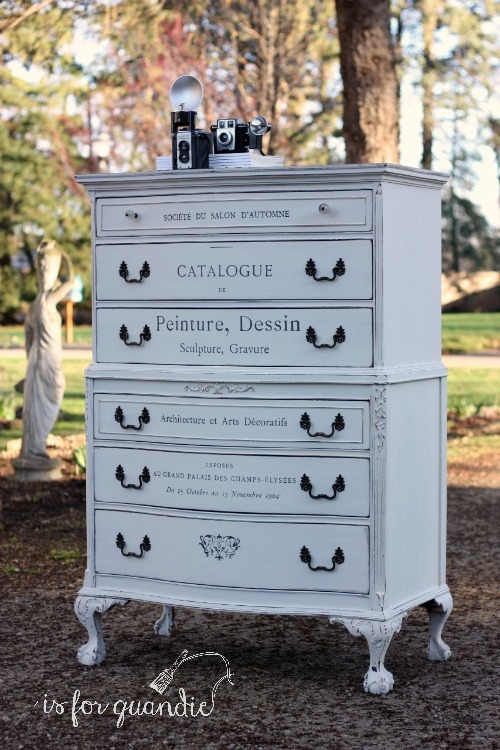 Hi Ms Q, First I want to say that I am in love with painted furniture and I love this piece. I love how the character of the piece is enhanced by the paint and the scuffs only highlights it more. The transfer then is icing on the cake. Thanks Regina! I like that analogy, icing on the cake! What a difference. It stands out so much more. I like the old knobs too. Very nice. It seems like quite a few people like the drawers pulls, so I’m glad I left them! Now that’s a showstopper! Those gorgeous features were really lost before. 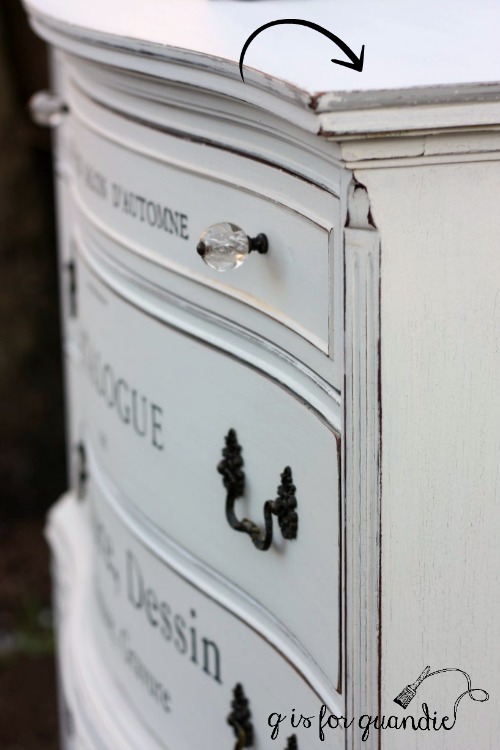 I love how the milk paint crackled. I’m wondering if it’s because the flat out is water based and it reactivated the milk paint when you applied it?? Now I’m really curious if it would have the same affect if the topcoat was sprayed? I’m going to have to try that … if it ever stops raining in Seattle 😀 Take care. That sounds like a logical explanation for the crackling. Keep me posted if you do some experimenting with it. The dark handles really help to make the transfers pop! Glad you kept them,what an eye you have, another beautiful transformation! Ha! 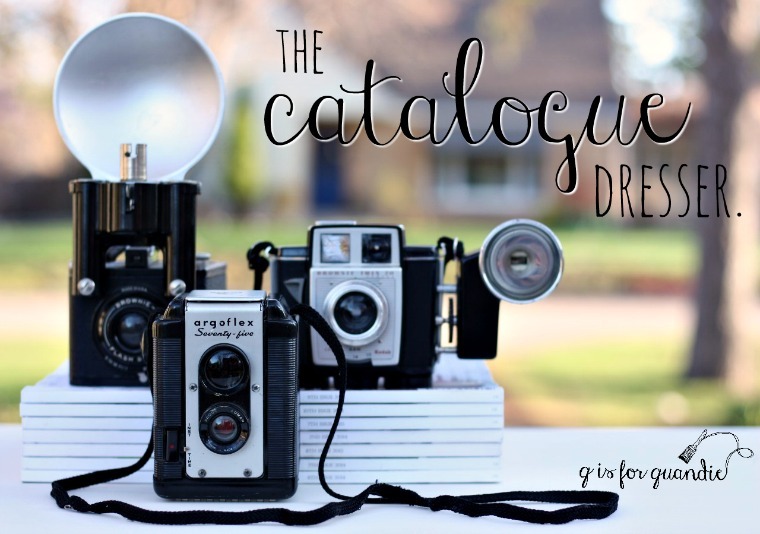 Knowing first hand how full your craft room is, that is really saying something! Absolutely gorgeous! And so much work. This is what I talk about when people think we just slap some paint on. You have obvious talent and experience to achieve this look. I do love the original handles but I would prefer them painted to match. Absolutely love the transfer totally takes it to the next level make that several next levels. This is such a gorgeous piece cant believe it crackled too!